Norbert Maroya, IITA-Ibadan; Morufat Balogun, IITA-Ibadan; Lava Kumar, IITA-Ibadan; Beatrice Aighewi, IITA-Abuja; Djana Mignouna, IITA-Benin and Robert Asiedu, IITA-Ibadan. While yam is an important food and income crop, one of the greatest constraints to its production is lack of high quality and clean seed especially of newly released improved varieties. There is competition between seed and food uses as the tuber can be used for both. Therefore, the aim of the second phase of the Yam Improvement for Income and Food Security in West Africa (YIIFSWA II) is to set up a robust commercial seed system to supply smallholder farmers with high-quality clean seeds of improved, released, and market-preferred yam varieties through private seed companies. 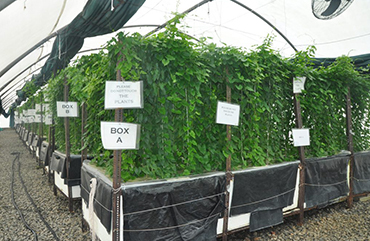 Four seed companies—Da-Allgreen Seeds Ltd., Biocrops Biotechnology Ltd., Nwabudo Agro Seeds Ltd., and PS Nutraceuticals International Ltd., were selected to establish an aeroponics system (AS) for basic seed yam production. Biocrops Biotechnology Ltd. had earlier benefited from one aeroponics system from YIIFSWA, and has agreed to build a second. All four seed companies committed to invest in AS technology and based on the development of each seed company’s business plan, the updated LoA was signed. The four seed companies had an aggregated land total of 50 hectares dedicated to producing basic seed yam annually. Business plans were developed together with each seed company that included information about the number of AS to be constructed, probable source of funding for investment, and their market strategy and development plan. These new, high-ratio propagation technologies have generated a lot of attention mainly from new business actors such as the Federal Ministry of Agriculture and Rural Development, the Nigerian Stock Exchange, Nigeria Agribusiness Group (NABG), and GTI Capital Limited. Concerns on the food safety aspects led to the visit of the National Agency for Food and Drug Administration and Control (NAFDAC). A manual for clean foundation seed yam production http://yiifswa.iita.org/wp-content uploads/2017/10/Manual-for-Clean-FoundationSeed-Yam-Final.pdf and a video on AS www.youtube.com/watch?v=lCwyPG1P9JY was produced. The breeder seed production, initiated with a stock of 2,264 plantlets in January, was bulked to produce 36,550 breeder seeds at end-December using the Temporary Immersion Bioreactor system (TIBs). From the breeder seed produced, around 7200 TIBs plantlets were successfully hardened and partially used to plant two aeroponics systems that generated over 100,000 single-node vine seedlings transplanted in the field at a density of 40,000/ ha for basic seed yam tuber production. 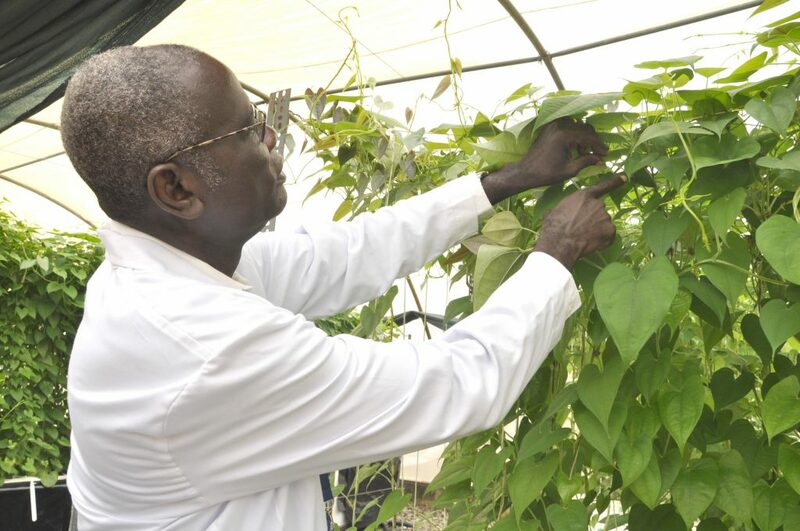 While the single-node vine cutting from aeroponics for basic seed yam production has the advantage of starting with virus-free planting materials, these can be reinfected with time in the field. The reinfection rate of virus-free seed yam in the fields was up to 7% of virus infection recorded between planting of the single vine in October 2016 and April 2017. The spatial variation in infection rates was typical for insect-transmitted viruses. The 80 performance demonstration trials spread across farmers’ fields in six states [Benue (15), Enugu (6), FCT (10), Nasarawa (16), Niger (15), and Oyo (18)], were planted with three improved and released yam varieties (two Dioscorea rotundata [TDr 89/02665 and TDr 95/19177] and one D. alata [TDa 98/01176]). One location-specific farmers’ best variety was used as a check to assess varietal performance and to quantify the superiority of the improved varieties over the locals. At harvest, results revealed that TDa 98/01176 had the highest yield with a mean of 19.1 t/ha followed by TDr 95/19177 with 18.0 t/ha. TDr 89/02665 which had smaller seeds at planting recorded 14 t/ha while FB had the least yield with a mean 12.1 t/ha. The maximum yield for each variety was recorded in Oyo (TDa 98/01176, 34.6 t/ha), Nasarawa (TDr 95/19177, 31.5 t/ha), Oyo (TDr 89/02665, 24.6 t/ha) and (FB, 22.7 t/ha). In areas where these improved varieties perform below the local best in terms of food quality or market preference, we promote the local best or market-preferred varieties by cleaning them against the major viruses affecting yam.